Second-generation Land Rover Evoque gets hybrid option	. CHICAGO—At the Chicago Auto Show, Land Rover took the wraps off the newly redesigned Range Rover Evoque. Originally introduced for the 2011 model year, the second-generation subcompact SUV has undergone a complete makeover, featuring a hybrid powertrain option, advanced driver-assistance tech, and what Land Rover calls "groundbreaking" off-road tech. 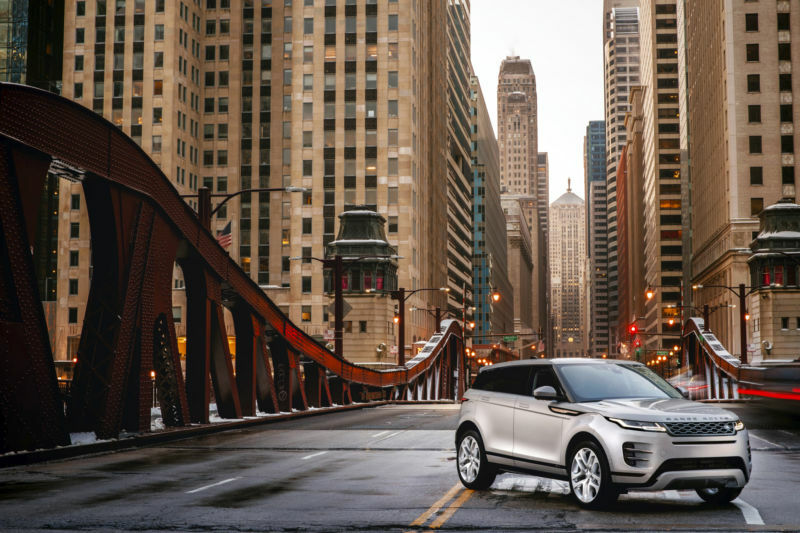 Starting at $42,650 for the base S model, the 2020 Evoque keeps the coupe-like silhouette and dimensions of the first-generation models. Although it's roughly the same size, Land Rover has carved out more interior space for the second-gen Evoque to make the backseat more comfortable. There's also 6 percent more luggage space (now 21.5 cubic feet), which expands to 50.5 cubic feet when the back seat is folded flat. 48-volt mild hybrids: A possible cure for diesel emissions cheats? Other new features include "ClearSight Ground View," which projects a virtual view of under the car onto the upper display. The Evoque also gets Smart Settings, which first appeared on the all-electric Jaguar I-Pace. Smart Settings takes cues from how the driver interacts with the car and the road to automate music, climate, steering column, and seat-position settings. Land Rover has also dropped an HD display into the rear-view mirror so that drivers can get an unencumbered view behind the car regardless of passengers or cargo. Beyond the Evoque, Jaguar Land Rover is betting heavily on electrification and autonomous driving. In his presentation at the Evoque unveiling, JLR North America president and CEO Joachim Eberhardt touted the company's partnership with Waymo, which will be deploying 20,000 self-driving Jaguar I-Pace SUVs over the next couple of years. The appearance of a hybrid Evoque is the result of JLR's commitment to offering a mix of mild hybrids, plug-in hybrids, and fully electric vehicles across its lineup.